This article originally appeared on stevebaker.info. 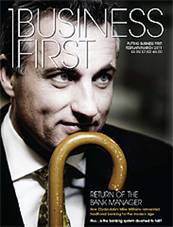 Business First Magazine has published a cover story by me and my Cobden Centre colleague Robert Sadler, It’s not enough to bash the bankers. In the article, we argue that the collapse of the present banking orthodoxy is inevitable. So-called “quantitative easing”, plus the inflationary combination of central banking with fractional reserve deposit taking is unjust and we should insist that banks operate according to the same commercial principles as any other business.